Know What U Eat: What if you were told you weren`t getting enough cellular oxidation or free radical protection, despite consuming all the high antioxidant foods and some of the best antioxidant supplements available? Would you wonder how that could be, or would you simply ignore it? Don`t ignore it, read on. How it could be, according to many health experts, is that your glutathione levels are too low. This is a very common situation with all the oxidation stress our toxic environment provides, along with a little help from our own personal stress. Moreover, the air we breathe is loaded with toxins and heavy metals as well as in many of the foods we eat, and any pharmaceuticals that may have been taken. All of these create more free radicals while burdening our bodies with toxic material. Add this to the immune system`s damage from psychological stress with our modern lifestyle and the madness around us. Well then, it is amazing that many of us are still walking and talking! Well, we all know the vital key to maximise antioxidant activities for cells are present in fresh fruits and berries, which help preventing diseases and scientists believe help repair and/or prevent the stress of oxidation, a process that occurs naturally during normal cell function. Do remember, smaller the procedure of consuming fruits, higher is the antioxidants we get. 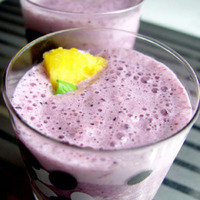 Blend together berries, pineapple,frozen yogurt, ice chunks, milk and honey or maple syrup if required into thick smoothie, serve chilled immediately.